Now that makes it easy, doesn’t it? 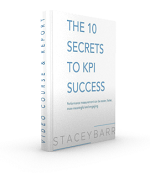 Someone has put together a list of the 20 best KPIs for your business. Saves you the time of trying to figure it out for yourself, yes? But does it really save time in monitoring performance? Wasting time trying to figure out how to quantify or implement the KPIs. Wasting time collecting data and analysing and reporting KPIs that no-one finds useful or relevant to our strategy. Wasting time trying to sell the KPIs to everyone else, to get their buy-in, which won’t happen because they weren’t part of the KPI selection process. Wasting time in performance review meetings, debating the relevance of KPIs, instead of using the time to interpret and decide on our priority performance improvement actions. Wasting time improving an area of performance that takes attention away from our organisation’s actual performance shortfalls. There are a few assumptions we need to test before we put our faith in the good work of those folks who compile KPI lists for us. Testing these assumptions will help us make the most of those lists of KPIs in the context of our organisation’s unique personality, unique strengths and weaknesses, unique strategy. Assumption 1: Are they all real measures? What makes a measure a real one is that the quantification method is apparent. For measures like Customer Satisfaction, Net Profit, and Revenue per Employee, it’s easy to imagine what’s being quantified and what it might look like to monitor this over time. But for so-called measures like Quality Index, Innovation Rate, and # Water Scarcity Index, it’s anyone’s guess how they are quantified, or what they even mean. We must first be capable of recognising real measures from vague concepts before we consider any KPI from any list. Assumption 2: Can we find out how to calculate them, exactly? Customer Loyalty is a generic measure that we know we can quantify. But exactly how should it be quantified? Is it the percentage of customers that give us repeat business? Or is it the percentage of customers who refer us to others? Or is it their total lifetime spend with us? Or is it the proportion of their budget for services we offer, that they spend with us versus our competitors? Or is it the average rating, perhaps on a 10-point scale, that they give us when we ask them how loyal they are to us compared to our competitors? Or is it something else? Many KPI lists won’t tell us which way is best. We shouldn’t accept any KPI from any list, unless we can know not only its name, but a clear description of how it is quantified. Assumption 3: Do they align to our strategy? We don’t take medication just because other people we know are taking that same medication. We only take medication when we have a problem that it is designed to fix. So why would we adopt KPIs just because others are using them? KPIs are more like medication than they are like candy. We have them because we need their help, not because they’re fun. Why would we measure Time to Market if our customers care much more about the accuracy and attention to detail of what we produce, than they do about how quickly we get it to them? Why would we measure Employee Satisfaction Index if we valued employee’s engagement and ownership of the organisation more than how satisfied they are with it? We’ll get the right information for us when we choose KPIs that evidence our strategy, our unique performance priorities. Assumption 4: If that’s all we measured, would that be all we needed? If every organisation adopted the same list of Fabulous 20 KPIs, isn’t that the same as saying every organisation has the same priorities, the same weaknesses, the same strengths, the same vision, the same values, the same customer preferences, the same business process designs, the same culture? It’s ludicrous. An organisation’s KPIs should be a reflection of their uniqueness, not an assumption about their sameness. When we cascade our strategy throughout our organisation, we are creating a bespoke framework for all the most important things we should measure, to help us move from what we uniquely are now, to what we uniquely want to become. Assumption 5: What level of care went into the choice of KPIs on those lists? Do you know that most compiled lists of KPIs are generated by popularity and prevalence, not deliberate assessment of their impact on organisational success? Most large KPI databases are built from crowd sourcing KPIs and from trawling as many reports as possible to collate every possible KPI used in an industry or sector. Cost per Museum Visit, Parking Revenue per Transaction, and Pest Exterminations Performed feature in a list of the top 25 local government KPIs, but only because they are the most used by local government. I’ve learned that most people don’t have a clue about how to measure the meaningful stuff, so they default to measuring the easy stuff, the activities they perform, the widgets they generate. These are not strategic KPIs. They are mostly operational statistics. Assumption smasher: We must give careful thought to our choice of KPIs, for their value and impact on organisational performance and not because they are easy to implement. So can we get any value at all from compiled KPI lists? Care to share any other lists of KPIs that you’re aware of, and how you’ve used them? This post is now open for comments – our new website security was a over zealous! Just wanted to say I’m so glad to have you back to weekly. Missed your insight and incredible knowledge. I understand weekly is a lot more work for you but I do get a lot out of it and really appreciate everything you share. Thank you for your words of wisdom, they keep me on track while dealing with so many management distractions. Scott, thanks for your encouragement. I love thinking and observing and learning and writing and sharing it all. So grateful to have an audience like you! As for pre-packed KPIs, they cut out all the thinking as Stacey says. And it’s the thinking, our thinking about our process/ product/ business, that’s the most important part. Is there a place for ‘borrowing’ ideas from elsewhere? Yes there is but only after we’ve nailed down exactly what it is that we want to achieve.